ABBOTT PARK, Ill., Aug. 2, 2018 /PRNewswire/ -- Parkinson's disease and essential tremor patients can now benefit from upgraded functionality with Abbott's Infinity™ DBS system. Abbott (NYSE: ABT) today announced U.S. Food and Drug Administration (FDA) approval for an over-the-air software upgrade for all currently implanted Infinity DBS systems that delivers magnetic resonance (MR)-conditional labeling and innovative features. This life-changing technology from Abbott helps patients with progressive diseases live better. Prior to the latest Abbott approval, people new to deep brain stimulation (DBS) therapy or those living with older systems from other manufacturers may have experienced barriers in accessing the most advanced DBS therapy options because of the potential need for an MRI in the future. With its updated labeling, Abbott has addressed this challenge with the Infinity DBS system's improved therapy platform — the first and only FDA-approved MR-conditional directional DBS system. 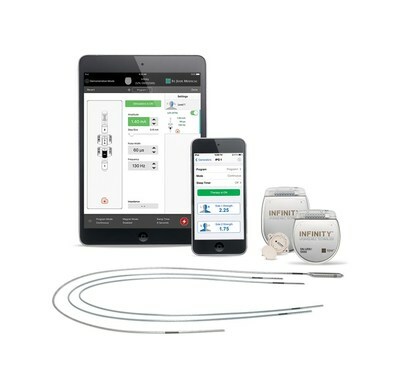 "With this software upgrade, Abbott delivers on a promise to develop powerful features that strengthen the Infinity DBS system's already patient-centric platform, which uses familiar Apple technology and frees the patient from recharging their device," said Binith Cheeran, M.D., medical director of movement disorders at Abbott. "We are committed to continued innovation in neuromodulation, developing ongoing advancements and efficiencies for physicians and, most importantly, helping thousands of people who are battling movement disorders live fuller lives." "Today's announcement of the newly released MRI-compatibility of the Infinity DBS system reflects Abbott's continued commitment to patient-centric, cutting-edge care — where the patient's options are expanded by the therapy instead of limited by it," said Brian Kopell, M.D., a neurosurgeon and director of the Center for Neuromodulation at Mount Sinai Health System in New York City. Parkinson's disease and essential tremor are neurologic conditions known as movement disorders, which are caused by a communication breakdown throughout the central nervous system. This can result in a debilitating loss of muscle control, involuntary movement and reduced coordination. At present there are no proven cures for movement disorders. Treatment options like Abbott's DBS system focus on alleviating symptoms to improve quality of life. Abbott's Infinity™ DBS system with directional leads is designed to direct stimulation toward targeted areas of the brain to maximize patient outcomes and limit side effects. The platform's future-ready technology is built with the ability to significantly upgrade the capabilities and new therapy features of the Infinity DBS system through simple, over-the-air updates. Abbott's Infinity DBS system is the world's first and only DBS system operating on an iOS software platform with Bluetooth® wireless technology. Clinicians can streamline the programming process with an iPad mini device using Abbott's new Informity™ Programming Software to become more efficient in their practice and achieve optimal outcomes with directional leads. 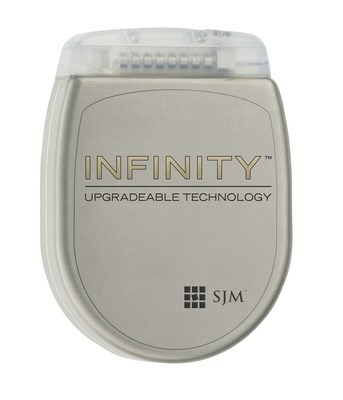 Patients can discreetly manage their symptoms with their Infinity DBS System iPod touch controller. Data continues to show that patients gravitate toward medical devices that are intuitive and low maintenance, such as with the Infinity DBS system's dual channel recharge-free device. Using an approach with patients at the center of their therapy experience, Abbott's neuromodulation portfolio is driven by science, data and patient input to help people suffering from movement disorders feel as normal as possible. "Our patients and our clinical team are seeing clear clinical benefits with Abbott's directional lead DBS therapy," said Craig van Horne, M.D., Ph.D., director of the Deep Brain Stimulator Center at the University of Kentucky's Neuroscience Institute. "The combination of directional lead therapy, MRI capability and simplicity in optimized programming could lead to a new standard of care for DBS therapy." Abbott's Infinity DBS system is also CE Mark approved and has been used in nearly 30 countries, most recently in Russia, Saudi Arabia and Taiwan. For U.S. important safety information, visit: https://abbo.tt/2JSxXBC. Note: Apple, iPod touch and iPad mini are trademarks of Apple, Inc. Bluetooth is a registered trademark of Bluetooth SIG, Inc., iOS is a trademark of Cisco Technology, Inc.
At Abbott, we're committed to helping people live their best possible life through the power of health. For more than 125 years, we've brought new products and technologies to the world — in nutrition, diagnostics, medical devices and branded generic pharmaceuticals — that create more possibilities for more people at all stages of life. Today, 99,000 of us are working to help people live not just longer, but better, in the more than 150 countries we serve. Connect with us at www.abbott.com, on Facebook at www.facebook.com/Abbott and www.facebook.com/AbbottParkinsons on Twitter @AbbottNews and @AbbottGlobal.